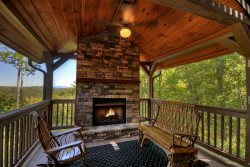 Come vacation in this Country-Chic abode located in downtown Blue Ridge, within walking distance to shopping and dining the town has to offer. Perfect for a wide array of occasions, this fresh and updated home is decorated with the finest art around. Enjoy some TV time in the living room on the large leather sofa with a 32" Flat Panel TV, or have some "you time" on the front porch as listen to the crickets or whatever sounds the eclectic downtown area has to offer. If you're not taking advantage of the dining opportunities offered by the convenience of your location, take advantage of the fully equipped kitchen with stainless appliances. After a long day of vacationing, you'll find comfort in either a King or Queen bed where it's easy to pull back the comforter, slide on in, and call it a day. Staff were always friendly when I called. Home was clean, safe, and charming. Staff was friendly and efficient. Location of home was incredibly convenient to EVERYTHING. Your staff is great! Very helpful and friendly on the phone and in the office. Have stayed with you before and have always enjoyed our stay. Just very surprised and disappointed with the toilet paper thing. The communication was easy altho I did speak w three diff ladies. They were all helpful and lovely. Ashley was in the office when we checked in and she was helpful w recommendations about the area Our stay was great. Overall we enjoyed it very much. The cottage was just as pictured in your adds. Checking in and out was very easy. Plenty of info. Property was very clean. Just as pictured in ads. The kitchen appliances were all very nice. The furniture in the living area was very nice and comfortable. The bedrooms were comfortable, the only drawback was storage. No place to hang clothes or to put suitcases in one bedroom. There were 4 women on this trip and only one bathroom. We made it okay by drying hair and putting on our faces in the one bedroom with mirrors. The decor was beautiful. The process was easy. Southern Comfort made sure we had everything we needed for a great trip. Charming. It had all the comforts of home. This is my second time staying with Southern Comfort and each time has been a wonderful experience. We have another week booked at Thanksgiving. This is a great place to book a mountain vacation. We stayed at a down town rental. I loved it clean cozy and very relaxing. Equipped with all your needs and much more. Thank you for a worry free vacation! Everyone we dealt with was extremely professional and friendly and seemed genuinely excited about the property we were renting. The whole experience was easy and fun. High Country Cottage was probably the best vacation rental experience we have ever had. The house is adorable, and perfectly updated for modern needs. The proximity to town, plus the quietness of the property itself made for an ideal weekend getaway. We will absolutely be back!